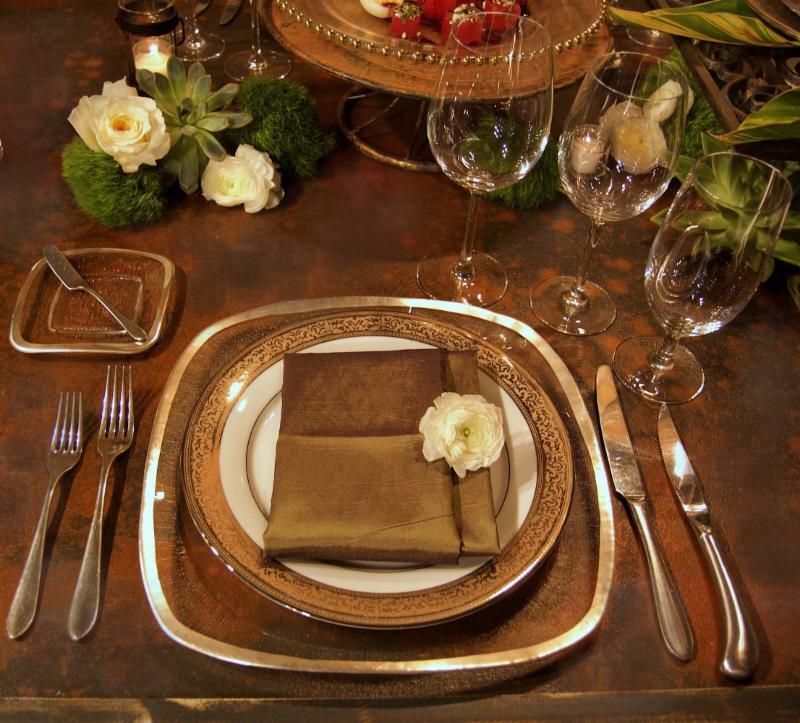 Zachary Greatting, Chef, Sommelier, Owner of three year old °Brix Catering & Events (and former opera singer) invites you to "Be Our Guest" at his Guest Designer Table which highlights his favorite type of party--a small dinner featuring a five to seven course dinner with wine pairings. 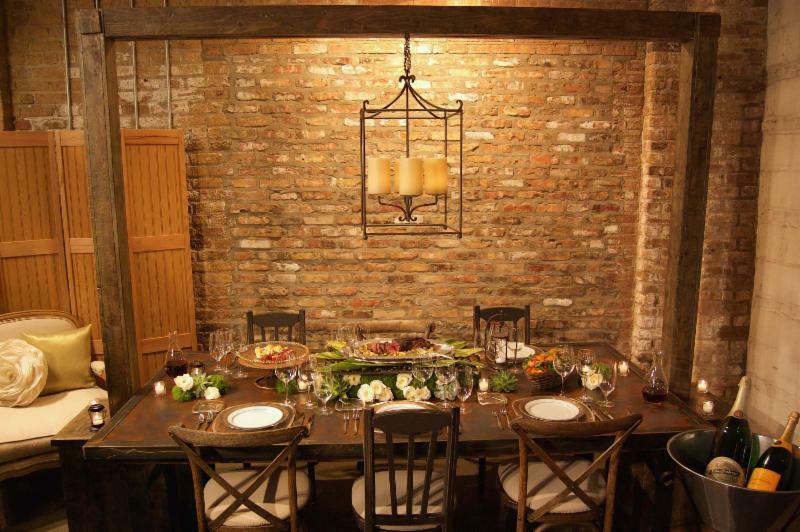 To make this setting more intimate, he used our new Aged Farm Light Bridge to support a chandelier from our Industrial Props collection. Zach was very excited to use our brand new, modular Industrial Table which includes a steel frame, rusted inlay and angled steel legs. 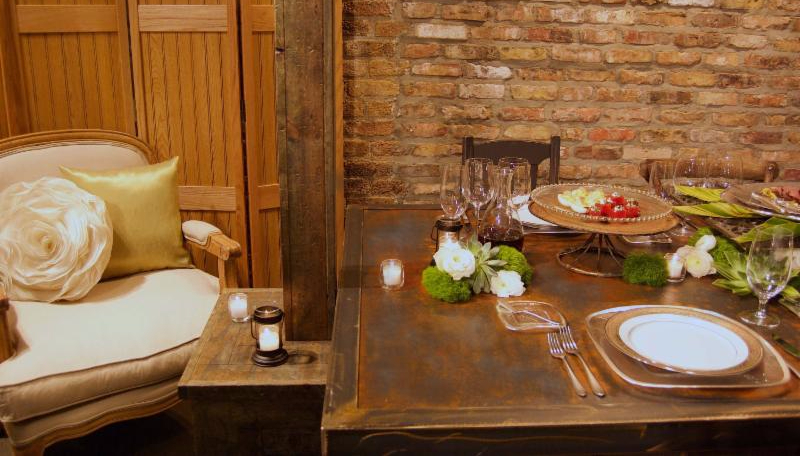 Zach said the table served as the inspiration for his design which he wanted to be warm and inviting for an intimate dinner--but with an edge. We think he succeeded and love his use of the Aged Farm Light Bridge column as an extra surface for votive candles. For the centerpiece Zach used our Rustic Iron Grate with brick risers. The bricks are well hidden by the long, low floral décor. Normally, this riser combination is used as an alternative to a chafer for keeping food warm, but it works perfectly as a rustic presentation for a classic roast tenderloin of beef on a bed of mixed parsnips, zucchini, brussels sprouts and carrots: a harbinger of an early fall. Zach said "long and low" is a must for a centerpiece to encourage intimate conversation. We particularly like the way he did it here by adding our Hour Glass and Metal Holder prop as one of the bibelots to extend the centerpiece. 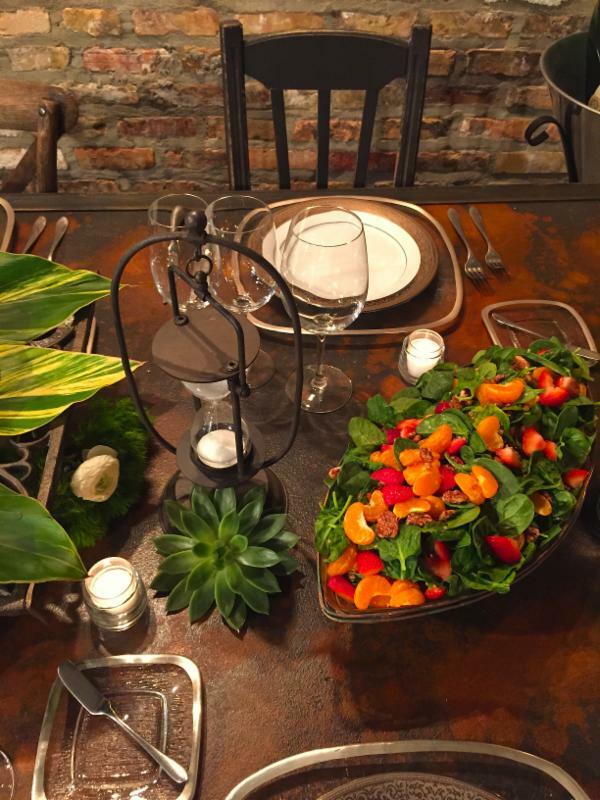 Our Crescent Copper-linked Bowl is in keeping with the edgy part of the look and holds his beautiful baby spinach salad with strawberries and mandarin oranges which add more fall color. Keeping the look clean is important (especially where the colors of the table show through the Italian Square Glass Buffet plate), but also to show off the food. Zack believes in Classic French Technique with a creative twist and always incorporates seasonal items. Our Classic Euro flatware and Pistol-handled Steak Knife work well with his clean look. The succulents and "puffs of white" add a softness to the long centerpiece and the individual place settings. In addition to off-premise catering, °Brix has a private event space at their kitchen at the border of Ravenswood and Uptown: a very homey, very eclectic space that holds up to 70 people for cocktails. When we asked Zach how he keeps up with trends, he told us the best way he knew was to get out to restaurants. He practices what he preaches because he often cooks in friend's restaurants on his evenings off to keep himself sharp and up to date. He highly recommends "Industry Night Out" as a source for restaurants dedicated to serving hospitality industry employees at a discount. 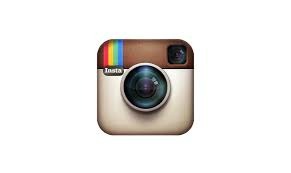 Check out Industry Night Insider. In addition to the love of cooking, wine is especially important to Zach who is a Certified Sommelier from the Court of Master Sommeliers. He loved telling us about a recent party where he decanted his client's Barolo 24 hours ahead of time. 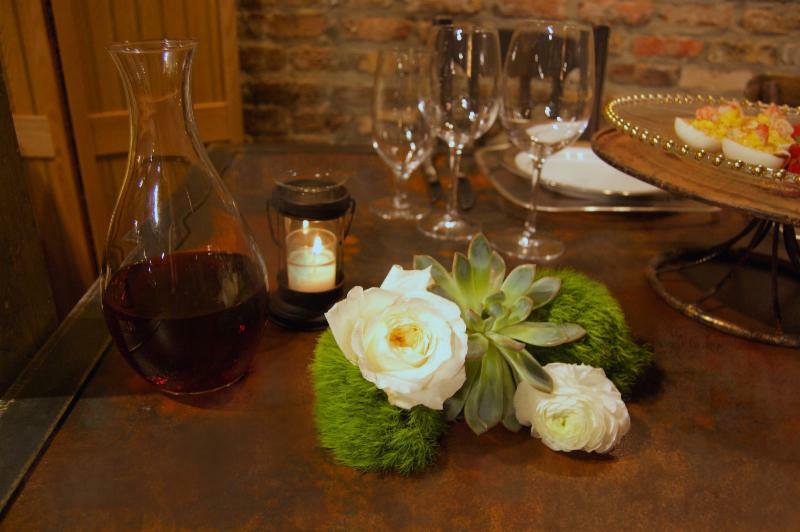 He used our Glass Oval Decanter for the table shown here. Unfortunately, he did not serve us a fancy Italian wine for the photo shoot but we did learn what °Brix means in the world of wine. Did you know that °brix measures sugar in wine grapes that ultimately determines how much alcohol the wine will have? Please welcome a newcomer to our industry, check out brixcatering.com and congratulate Zach on his upcoming wedding in two weeks. We will be thinking of him as he winds (and wines) his way through Burgundy on his honeymoon!